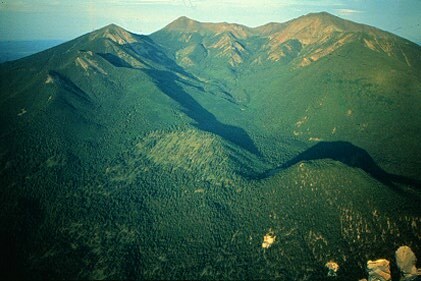 The regional geologic character of Flagstaff is relatively young volcanic activity overlying relatively old sedimentary rocks. Outcrops of rocks approximately 235-275 million years old from the Moenkopi, Toroweap, and Kaibab formations can be seen at various locations in and around Flagstaff, which lies at the southern edge of the Colorado Plateau. Volcanic activity began about six million years ago and continued until Sunset Crater erupted about A.D. 1064. Lava flows formed several of the mesas in town. Eruptions produced the many cinder cones and the stratovolcano of the San Francisco volcanic field. Precipitation and runoff sinks through the cracked and fissured volcanic rocks, moving down until it reaches the Moenkopi formation, which contains clay and is relatively impervious. It eventually emerges again in springs. In Sinclair Wash heading east from Lonetree Road, the channel of the Rio de Flag lies in the Kaibab limestone along the southern edge of a basalt flow. Unlike the relatively hard basalt, limestone dissolves in water leaving cavities in the rock. In the area of Continental Estates, so much limestone has dissolved that large pits have formed. South of I-40, the Rio flows through a fault-bounded valley. Water seeps down through the fault into the aquifer, from where it can be pumped up again by Flagstaff's wells.